Two antique Kurdish rugs lie side by side. One portrays a field of flowers contained in a series of diagonal stripes. One row bends progressively to the right, while the next jogs sharply to the left. The border, depicting a crenellated fence motif for most of its length, is suddenly transformed into a series of connected diamonds near the top of the carpet. 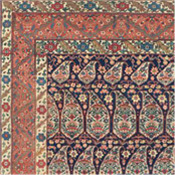 On the second Persian rug, a simple double-lined border is abandoned after one foot, never to be taken up again. In one corner of the field, two stick women with elongated heads watch over a menagerie of creatures roughly resembling a gazelle, three dogs, a cat, a camel, two sheep, a peacock, two hens and a monkey. Close by, another stick person has an enormously oversized flower for a head. Such whimsical signs of spontaneous creativity, along with wool of unmatched luster and strength and natural colors which create an incredible depth and subtlety, provide endless delight and fascination for the viewer of Kurdish antique tribal rugs. Yet, even though over the past two decades the weaving of the other major tribal groups of the Near East has been thoroughly researched and documented, the Kurds remain the only major antique rug weaving class to receive little focused attention. It is these shaggy, unsophisticated rugs of infinite charm which comprise one of the last undiscovered folk art treasures of the Orient. The Kurds, an Iranian tribe which is believed to have inhabited the Azerbaijan area since before the age of Christ, today number an estimated 10 to 13 million. They not only inhabit the 140,000 square mile region of Western Iran, Eastern Turkey and Iraq known as Kurdistan, but also the mountains of Persian Azerbaijan and the Soviet Caucasus further to the North, as well as the Khurasan district of Northeast Iran. The Kurdish lifestyle of today is tremendously varied: from the nomadic mountain shepherd, to the village farmer who yields small crops of wheat and barley, to the flannel-suited urban businessman. Yet in each setting, the Kurdish women continue to hand-knot rugs as their ancestors have done for many generations before them, creating antique rugs that vividly portray the tremendous diversity, adaptability and spirit of independence of the Kurdish people. To a remarkable extent, Kurdish rug-makers have always readily adapted the antique carpet patterns of the neighboring weaving traditions into their own carpets. This is clearly seen in the nomadic and village pieces of the Kurds of Azerbaijan and the Caucasus. 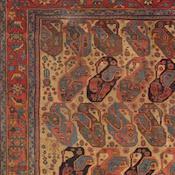 The Kurds of “the Northwest,” as they are called, adopted the prevalent Caucasian carpet designs of Kazak and Karabagh such as the diagonally striped field, and the crenellated fence and stylized dragon borders, yet their antique rugs are always distinguishable from those of the Turkic groups in both their extreme spontaneity and unusually wide selection of colors including a liberal use of pink, lime to forest green, powder and sky blue, orange and yellow. 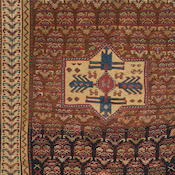 In fact, in many antique Kurdish rugs of the Northwest, color becomes the dominant element even over design, and the definition of the pattern is virtually obscured in a blazon of color. The effect, undeniably Kurdish, makes their antique carpets masterful examples to be studied by the modern abstract artist. 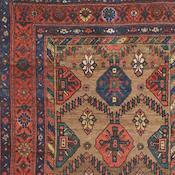 Yet, these Persian carpets are woven by the most elemental of peoples. The Kurdish mountain weaver, almost always a woman, lives with her family in a black goat-hair tent which can be easily transported to the high mountain pastures for the brief summers and into the valleys below for the extended winters. Using a primitive, portable loom, she is a master not only at weaving wool into a stylized representation of the magnificent natural landscape in which she lives, but also at performing numerous other processes of rug making as well. She gathers plants and roots which grow locally to brew a virtually endless array of colors. She washes, cards and separates the wool from her family’s own sheep, setting aside much of it to be pressed into felt and choosing only the best to be woven into carpets. Then, as she goes about her daily chores, she endlessly spins the wool into yarn using a simple drop spindle, for often the process of spinning is even more lengthy than that of the knotting itself. The art of rug-making, the nomad’s primary means of creative expression, is also a valuable method teaching the young of the symbolic language of patterns and color which comprise the cultural heritage of the Northwest Kurdish people. In many Northwest antique Kurdish rugs, evidence that the young tried their hand at weaving is obvious. A few rows of flowers in the middle of a rug take on the wobbly lines of as yet unsteady fingers, and then suddenly the design continues with the clear, flowing patterns from the mother’s dexterous hands. 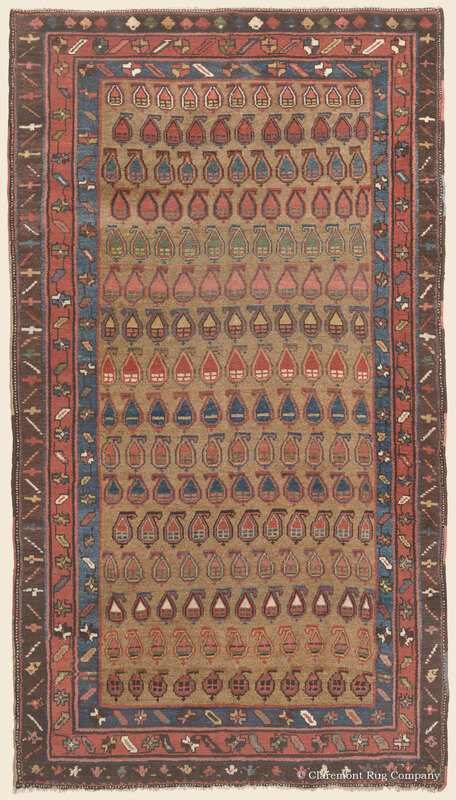 The fine examples of pile carpets, as well as the various storage bags using kilim and sumac techniques of the Kurdish of Northwest Persia, Eastern Turkey and the Southern Caucasus, represent folk art in its purest, most delightful state. Some 700 miles to the east of Azerbaijan lies the second great antique carpet weaving region of the Kurds, between the town of Quchan and Borjund in the Persian Khurasan. Moved here by the Persian shahs of the 17th and 18th centuries as a military buffer against the threatening Uzbeks and Turkomans, the adaptable Quchan Kurds of Northeast Persia have utilized the designs of the neighboring Baluches and Turkomans over the past 300 years. 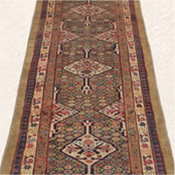 Often a Northeast Kurdish antique rug will be indistinguishable from a Baluche to the novice collector. However, to the more experienced its softer, more varied palette of colors, its more roughly drawn lines and a random use of tiny animals and flowers along with the primary design make the Oriental rug unmistakably Kurdish. Also, upon examination of the antique Kurdish rug’s weave, one notices that the Kurdish always use the symmetrical knot, while the Baluche and Turkoman employ primarily the asymmetrical knot. The antique carpets of the towns of Bijar (Bidjar) and Senneh in Persian Kurdistan show perhaps most clearly the resourcefulness of the Kurdish weaver. 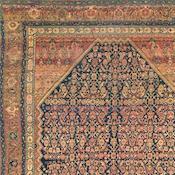 When Senneh became a provincial capital in 1880, its weavers were challenged to create antique carpets of the much tighter weave, closely cut pile and clearly detailed design preferred by the newly arrived Persian gentry. They responded to this challenge magnificently, producing textiles, often of silk foundation, with a knot density rivaling that of the workshop products of the major cities. Nearby Bijar (Bidjar) and the 40-odd villages which surround it were quick to follow. 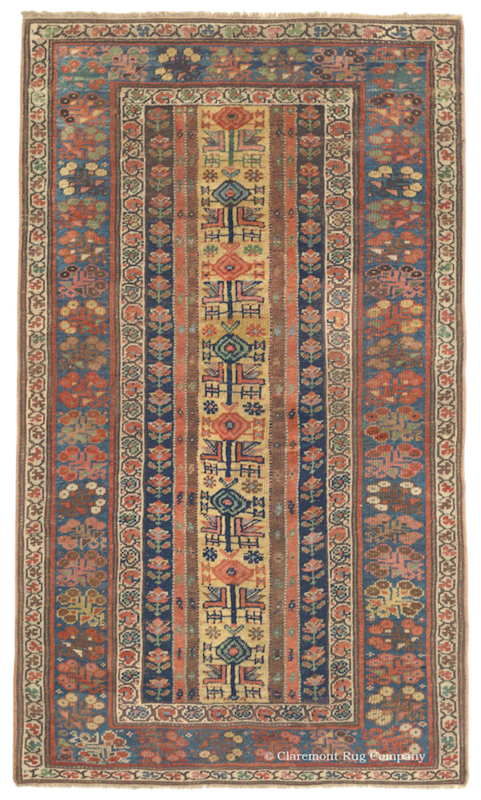 Geometric tribal antique carpet designs were virtually abandoned in favor of the intricate Persian floral motifs such as the herati, mina khani, medallion-and-pendant and harshang antique rug patterns. 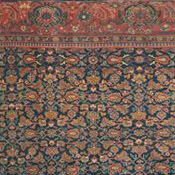 Although by the late 19th century and early 20th century the two towns were producing a sufficient number of Persian carpets to meet not only local, but also national demand, their quality did not suffer measurably because of commercialism as was the case in many of the weaving manufactories of the larger cities. Ranging from mat to palace sizes, the Bijar (Bidjar) carpets of this period exemplified the traditional Kurdish weaving virtues—lustrous superior grade wool, an extensive, harmonious palette of naturally dyed colors and an asymmetrical as well as symmetrical balance of pattern. 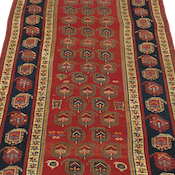 The Bijar (Bidjar) rug is also an outstandingly durable carpet, with the strong weave and rigid foundation which have earned it the title of “Iron Rug of Persia.” As well, Senneh is the home of a distinctive flatweave “kilim” rug utilizing a densely ornamented, curvilinear design which stands in sharp contrast to the bold geometric patterns of the kilims of nomadic tribes throughout the Near East. In short, the antique Kurdish carpet is a superlative example of age-old tribal art which is the cultural heritage of the Near East. Errors do not exist, only innovation; symmetry and perfection are of no concern, yet an asymmetrical harmony between color and design is of utmost importance. And dexterity of craftsmanship and quality of material reigns paramount.